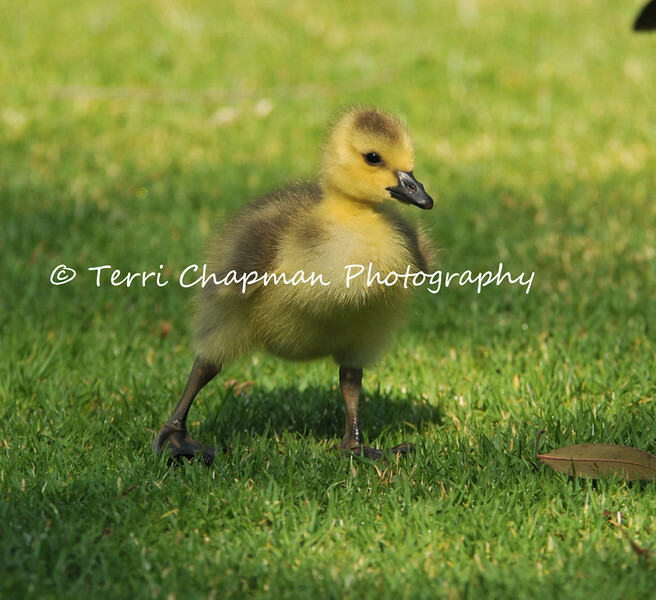 This image is of a Canada Goose Gosling that is a few days old and learning to walk on grass at the LA Arboretum. Soon after they hatch, goslings begin pecking at small objects, and spend most of their time sleeping and feeding. They remain with their parents constantly, though sometimes “gang broods” form, especially in more southern latitudes.Young often remain with their parents for their entire first year. Canada Geese are particularly drawn to lawns for two reasons: they can digest grass, and when they are feeding with their young, manicured lawns give them a wide, unobstructed view of any approaching predators. So they are especially abundant in parks, airports, golf courses, and other areas with expansive lawns.